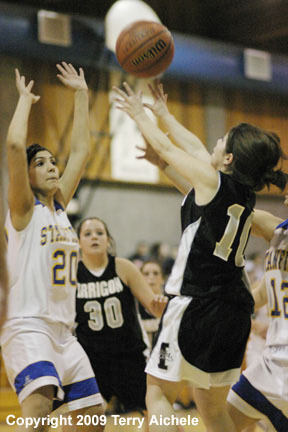 Kim Campos, in black, of Irrigon battles Tara Nichols of Stanfield for a rebound during the game on Friday. 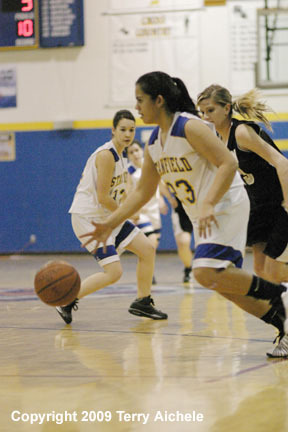 STANFIELD - The Stanfield Lady Tigers defeated the Irrigon Knights on Friday, January 23, 2009 by a score of 52-29. Stanfield had a height advantage that gave them strength on the boards but the scrappy Irrigon Knights didn't back down to the challenge. The first period started of slowly with Stanfield scoring first almost two minutes into the game. Irrigon came back to tie it up at 2 at the five minute mark. Tara Nichols for the Tigers and Noelle Wright for the Knights each hit free throws to tie it again at three all. 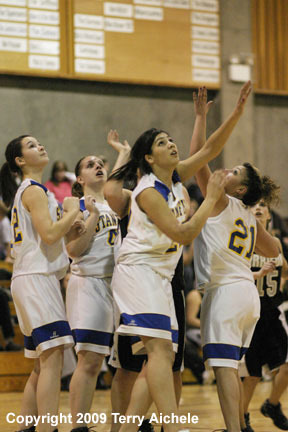 Stanfield then started breaking through the Irrigon defenders with Erica Gehrke and Nathalie Cook hitting shots. Stanfield led at the end of the first 8-3. Stanfield's defense clamped down on the Knights keeping them scoreless for the first three minutes of the second period. Mikayla Baros, Nathalie Cook, and Jami Erwert were the big scorers for the Tigers. Noelle Wright and Staci Stanger scored for the Knights. The score at halftime had Stanfield ahead 23-7. Irrigon came out shooting in the third period outscoring Stanfield 14 to 11. Cheyenne McKenney and Wright helped to ignite the Knights. Alyssa Sobotta, Erica Gehrke, and Baros scored for the Tigers. Stanfield led at the end of three 34-21. Stanfield spread the scoring around in the fourth. Among the Tigers scorering were Nichols, Carly Valadez, and Jade Martinez. 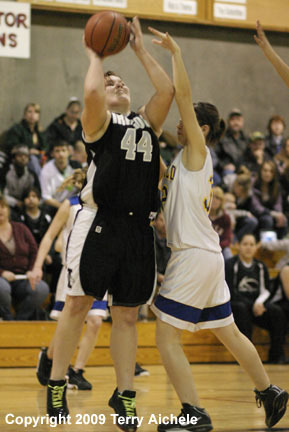 Kendra Kimble of Irrigon stole and scored on a layup. Other Irrigon scorers included Amber Cruz, McKenney, and Wright. 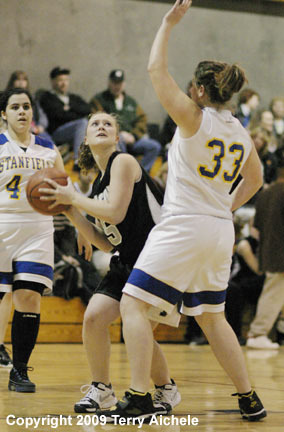 Stanfield maintained control of the ball and a strong defense throughout the fourth. Stanfield won with the final score was 52-29. 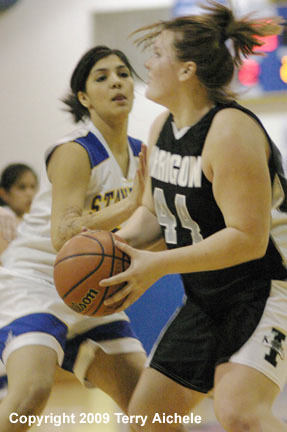 LEFT - Mikayla Baros of Stanfield drives to the basket while being guarded by Irrigon's Amber Cruz. 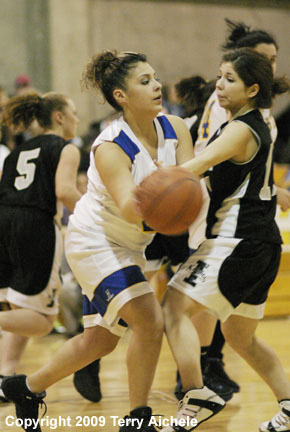 RIGHT - Jade Martinez of Stanfield sets up to take a shot. LEFT -Breena Tolar of Irrigon threads her way through Stanfield defenders including Mikayla Baros, Jade Martinez and Jami Erwert. 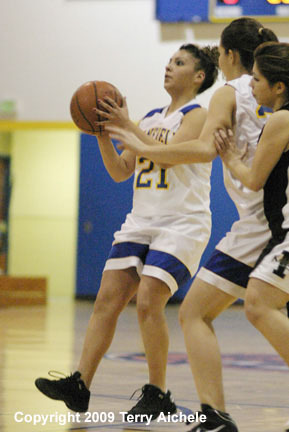 RIGHT - Jessenia Carrillo of Stanfield with the ball. 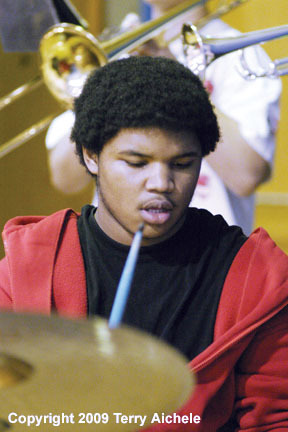 LEFT - The drummer for the Stanfield pep band lays down a steady beat. 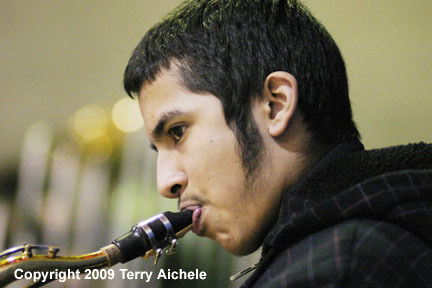 RIGHT - A member of the Stanfield pep band jams on the saxophone. 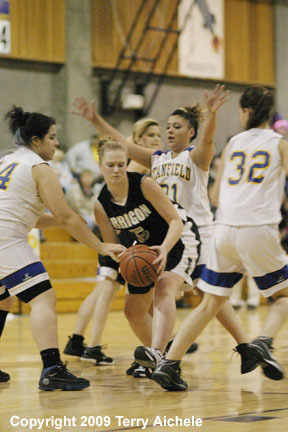 LEFT - Breena Tolar of Irrigon eyes the basket while being guarded by Tara Nichols of Stanfield. 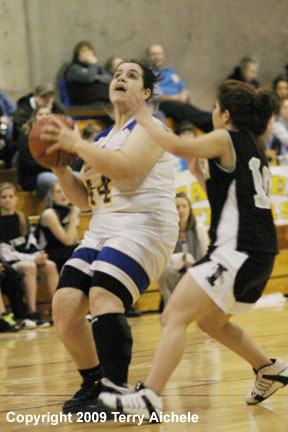 RIGHT - Noelle Wright of Irrigon looks to the basket while being guarded by Stanfield's Alyssa Sobotta. LEFT - Noelle Wright of Irrigon shoots a jump shot over a Stanfield defender. 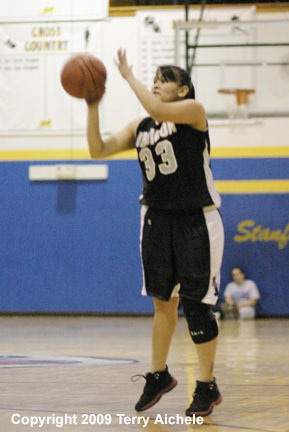 RIGHT - Kim Campos of Irrigon takes a shot during Friday night's game.